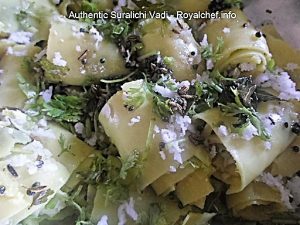 This is a easy to implement step-by-step Recipe for making at home delicious authentic Maharashtrian Style Suralichi Vadi. 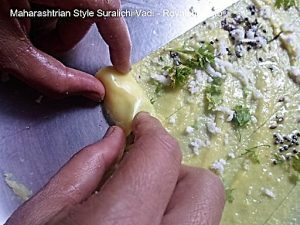 The Suralichi Vadi is a traditional Gram Flour preparation in the states of Maharashtra and Gujarat where it is called Khandvi. 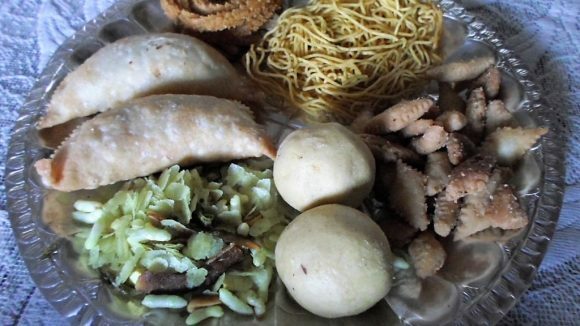 The Suralichi Vadi is an extremly popular dish for wedding, religious and festive meals in Maharashtra and Gujarat. The Suralichi Vadi can also be served as a stand-alone snack. 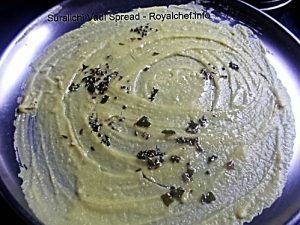 Mix the Gram Flour, Refined Flour, Green Chili-Ginger Paste, Turmeric Powder, Butter Milk, Water, Salt and then strain with a strainer. For the Tadka: In an another small Kadai heat the two tablespoon Oil and add the Mustard Seeds, Cumin Seeds, Asafoetida, Curry Leaves and mix it well and keep it aside for cooling. Take four big size stainless steel plates [because the quantity given for this recipe requires four plates] and keep them aside. In a medium size Kadai pour the mixture and cook on a slow flame until it become little bit thick. When the mixture thickens cover the Kadai with a stainless steel plate and cook for two minutes on a slow flame. Then remove the plate from the Kadai and divide the mixture into four equal parts and then pour each part of the mixture over each plate and spread evenly over the plate. 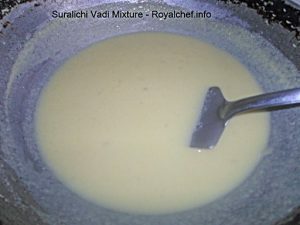 After spreading the mixture over the plate pour a teaspoon of the prepared Tadka over each of the plates. Then cut into 1” strips and after cutting roll the strips slowly. Prepare all the rolls from the rest of the plates and then keep them in a medium size bowl, then pour the remaining Tadka over the rolls and garnish with Coriander leaves and grated Coconut. The Suralichi Vadi is ready for serving.